Web Monday “connects users, developers, founders, entrepreneurs, venture capitalists, researchers, web pioneers, bloggers, podcasters, designers and other folks interested in Web 2.0 topics (in the broadest sense)” – as they say about themselves. This event takes place once per month on a Monday in several cities around Germany. Today, I was flying to Berlin to spend a week in the Mindquarry office and, hey – it’s Web Monday! 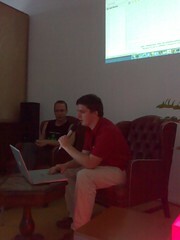 Right now, I sit in the Newthinking office and listen to Lars‘ presentation of Mindquarry. I am happy to be here, together with 40 other attendees. Lars told me that usually it is even more people – cool! 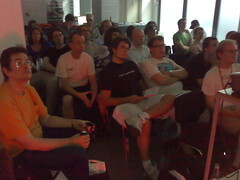 If you’re in Berlin on a Monday, check if it’s Web Monday, it’s worth being there. I am also happy to be here because finally, I got the chance to meet with Markus Beckedahl face-to-face.